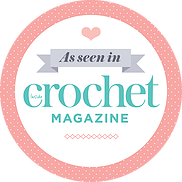 The makers of Inside Crochet magazine recently released a special “bookazine” edition : The Amigurumi Collection. They sent me a copy of the issue and I was happy to see photos of several of my hookabee patterns, as well as some select quotes by me from when they interviewed me earlier in the year. Have a look! I recommend checking the magazine out and maybe even picking up a copy for yourself. This special issue includes 33 amigurumi patterns (wow! ), a couple designer interviews, and several tutorials. It is packed full. The pattern designs span a huge range, including multiple animals, dolls, and food, all from different designers. They are divided up into several different categories: Cute and Cuddly, Fairyland and Woodland magic, Seasonal Fun, and Toys with a Twist. I think my favourite pattern is the Rapunzel doll with her tower by Lynn Rowe. That tower is so neat! For cuteness sent straight to your inbox, sign up for my amigurumi newsletter to receive emails filled with ami fun. You can also follow me on facebook, twitter, instagram, and pinterest to keep up to date on all things hookabee. Continuing with how to read written amigurumi patterns, I will now take you through different ways to write the same instructions. Missed the first two parts of the series? Catch up here: Part 1 & Part 2. There are no rules or specific guidelines that amigurumi designers must follow when writing up a pattern. I write mine the way I prefer to read patterns, with fewer words, so I know what I have to do at a glance. You won’t often see “make x stitches in the next x stitches” in my patterns. I don’t like having to find the numbers within the words to learn how many stitches I need to make. But, some designers prefer to write more words in order to explicitly tell the reader the exact stitch to work into, removing all ambiguity. I get the benefits of this method, too. But then, it isn’t just the number of words that can differ from pattern to pattern, but the symbols used and positioning of numbers. Some designers write the number of stitches before the stitch type (ex. 3 sc), while others write it after (ex. sc 3). For some patterns ‘2 sc’ means ‘make 1 single crochet into the next 2 stitches’, but for others it means ‘make 2 single crochet stitches into the next stitch’. Written out fully, this means: inc, 3 sc, inc, 3 sc, inc, 3 sc, inc, 3 sc, inc, 3 sc, inc, 3sc (30). The tricky thing about this method is that the number of repeats (in this case, 5 times) is not the total number of times you do the repeat, but the total number minus 1, because you already made one of the repeats! The pattern is indicating how many MORE times you need to repeat the sequence of stitches after already crocheting the sequence once. Let’s go through some more examples of different instructions. The first line of each will show how I write an instruction, followed by examples of how other designers may write the same thing. *sc2tog, sc in next 5 sts. Repeat from * 5 times. *sc twice in next stitch, sc in next 4 sts. Repeat from * 5 times. *Sc2tog. Repeat from * 5 times. There are even more ways to write each set of instructions than those listed here, but I hope these give you an idea of the variety that is out there and help you with deciphering a pattern you may be having trouble with. There is no right or wrong way to write an amigurumi pattern, each method works, as long as it is clear within the pattern how to read it. Make sure you read the abbreviations key and notes at the beginning of each pattern you work with, and read the entire pattern thoroughly before beginning to crochet. These simple steps may save you some time and frustration in the long run. Happy amigurumi making! Let me know if you have any questions on reading patterns. This is the first post in a tutorial series on how to read amigurumi crochet patterns. There are no set rules or guidelines for writing amigurumi patterns. Each designer has his/her own format, so if you like to make amis from many different designers (which you probably do! ), than things can get confusing. This series will allow you to decipher a number of different patterns and help clear things up. Amigurumi patterns can be written out (the usual method for designers in North America) or be in graphic form, such as charts and tables (more common for Japanese patterns). These blog posts will focus on written instructions, as that is how I design my patterns. Is there anything major I missed? Let me know in the comments below! Did you catch that one appreviation is repeated in two different locations with two different meanings? MC can mean “main colour” or “magic circle”, so be aware! Next time, I will take you through how to read a hookabee pattern that uses some of these abbreviations.